The Karwendel mountains are not just a hiking paradise, but also a fantastic location for active yet relaxing holidays on two wheels. Our mountain and biking specialist Christine will take you on tours to the most beautiful places in the region. And if you feel something pull or tweak after a long day in the saddle, we will give you a kinesio tape and a soothing wellness treatment. For hiking enthusiasts who know exactly what their bodies need after a long day in the mountains: relaxation and recovery. 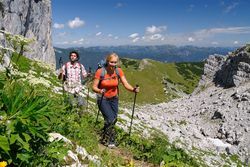 2,500 runners, hikers and Nordic walkers take part in this 52 or 35 km long march, leading from Scharnitz to Achensee with heavenly conditions. A huge sport festival! We have the perfect packages for active vacationers! For summer or winter vacations – our active Hotel Karwendel at Lake Achen offers an ideal starting point for your active vacation!